Scenes From a Marriage #7 – Plus News. Scene: Sterling the Cat is sleeping curled up on the sofa table. Carol is pushing on his belly with her fingers, saying “Knead, knead, purr, purr” over and over. Sterling the Cat takes no notice except to yawn and stretch, apparently enjoying what to him are scritches. She: I’m giving Sterling a taste of his own medicine. She: He keeps kneading me like a loaf of dough and purring in my ear at 4AM! Me: So you’re interrupting his sleep as payback. Me: You do realize that cats are immune to irony, don’t you? She: Oh….right. Then I’ll pick him up and hug him! There was a little more going on besides the metaphysical quirks of the house felines. For one thing, I’ve just confirmed that the Yamada novel, To Break the Demon Gate, has been delayed until later this year, probably November. 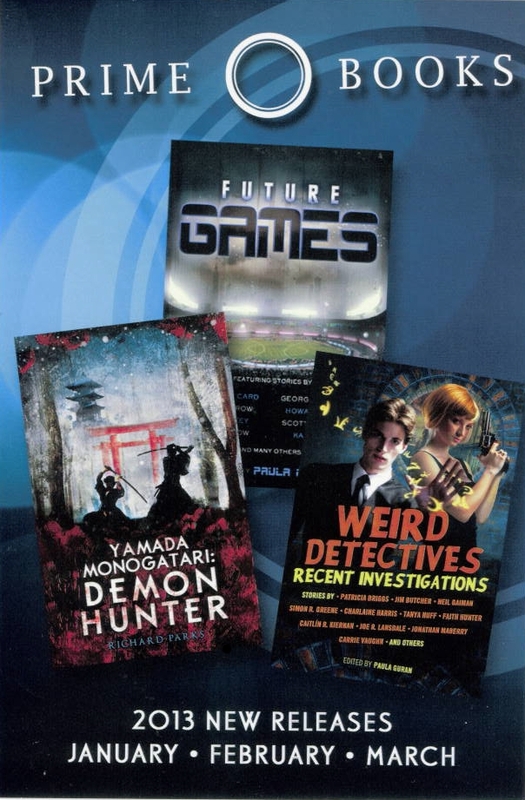 Also, there was the spiffy Prime Books notecard that shipped with the February Locus, including Yamada Monogatari: Demon Hunter along with Future Games and Weird Detectives. Since I’m in 2 out of those 3 books, I rather liked it. Also, LightSpeed Magazine will be reprinting “The Man Who Carved Skulls” in a future issue. I’ll give a date as soon as I have one, but from the writer’s perspective, you gotta love reprints—the work’s already done and you get paid again anyway. Speaking of work, I just finished the first story of the new year, working title is “The Nothing Boat.” I’ll need to set it aside to cool enough before I look at it again, which is fine because I have another story to work on. And a novel to write. I’m going to be busy this year, I can tell. This entry was posted in Collection, Process, Writing and tagged Prime Books, To Break the Demon Gate, Yamada Monogatari by ogresan. Bookmark the permalink.